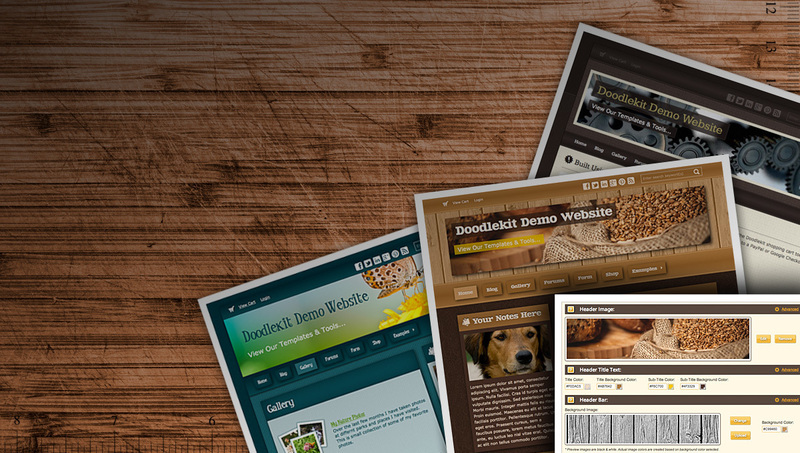 Pick any of our existing Doodlekit templates as a starting point. Then tweak and make changes to it till you have your own custom template. Use our template wizard to create a new template from scratch. Then go into the template and make any adjustments and changes you want. Export and share your custom designed website templates with other users. Import their templates and add them to your personal library. Stitching, spiral notebook, torn paper, wood trim, vines, and many other different types of border effects can be added to your Doodlekit templates. Pick background textures and patterns for different sections of your website. Change and manipulate their colors to match your template theme. Add layover images to your banners to create unique header designs. Pick overlaying effects from our vast library of plates. Change their colors. Hundreds of icons to choose from for your website. Thousands of different fonts to pick from for titles and content. New fonts and icons added regularly. Make templates with custom color schemes. Change background and text colors for different sections of your website. Choose any colors you want. Add shadows, round corners, make elements transparent, fade and blend colors, set borders, etc. There are unlimited design options and combinations. 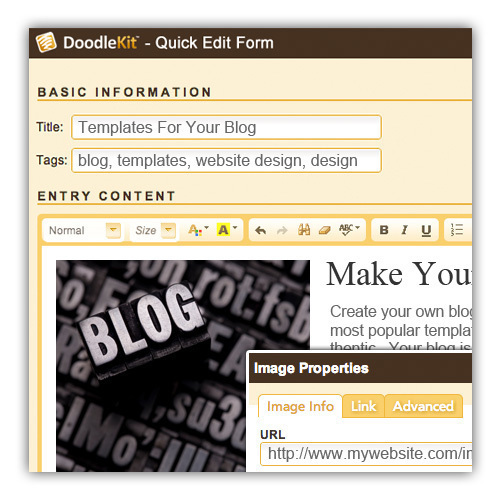 Doodlekit offers advanced template maker design tools for your website headers. You can create a header with a logo you upload. Add multiple logo images and your logo turns into a slideshow. Place your logo to the left or right of your title text. Center your header content or align it to the left or right. Pick a banner instead of a logo, and you can upload banner images into your header. Your title text will overlay your banner image(s) or you can opt to hide them if they already include text. Again, adding more than one image to your banner will create a slideshow. Add a banner 'plate' from our library of plate images to your website header. Change the plate's color. 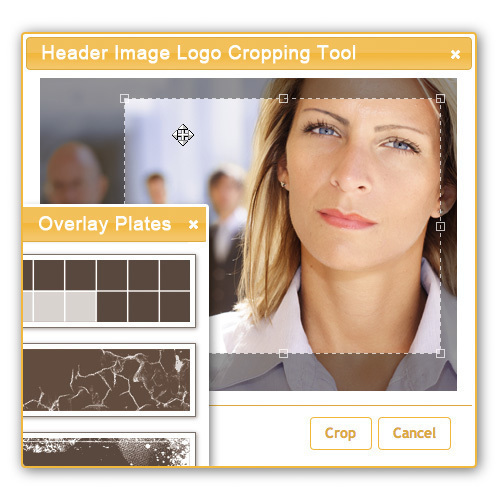 When uploading images for your logos or banners you have the option to crop, rotate, flip and resize them. Choose how you want your website laid out. One sidebar, two sidebars, no sidebars - you can even add a footer bar. Have wide sidebars or thin sidebars. Pick horizontal menus or vertical menus. There are lots of options to select from when it comes to how you want your content laid out. Even your pages come with different layout options. They include the choice to have different background colors for the header, use the same background color as the page, or have no background color at all. You can even add design effects to page headers like rounded corners, borders, shades, gradients, and inner shadows. The combinations are endless. Sections come with different styles as well, including the option for them to be contained inside a page or separate blocks. Perhaps the best new feature of Doodlekit's template creator is its online template wizard. With just a few keystrokes and clicks, you can create a completely customized and unique template. First your pick the background style you want - stretched or contained. Next you pick the website layout you want: how you want the sidebars, footer bars, and menus to look. After that you pick the page style you want: zero, one or two background colors. Then you pick the page section style - single block or multi-block. Last but not least, you pick your colors and preferences. Background colors and text colors first, followed by if you want to round element corners, have shadows, use gradient coloring, use transparencies, have centered content, use border effects, and tilt objects on mouse hover. Your website project is an uneasy burden. Maybe cost is an issue, your project is yours alone because you are a one woman show, or it just might be that you are the best graphic artist in your group. No one else gets it. You have to do it yourself if it is to turn out perfect. The big hurdle is you are not a programmer so how do you build your own site with your own hands? Are you asking for too much? You have a need for a website that offers multiple or rare fonts. Perhaps an unusual format is in mind, or your color scheme is one of a kind, or all of the above. A complex template design using a very detailed color palette is required. Your desire for the exact and proper placement of your forums, blogs, image galleries, albums, and website videos. You need to tie in all your social media. The content you intend on providing all has a purpose. It will lead to more customers, boosted sign ups for your weekly newsletters, the quality of forum contributions, increased sales through your shopping cart because of your creative and innovative coupon campaigns, or a bump up in traffic in general. An out of the box solution with just a few options won't do the trick. The ordinary web page templates available might give you just a few options, and it is disheartening. You'll have to give up more than half of what you want because you'll be compromising with the toolset you have in hand. If only you were a programmer, you could do it all in HTML, or is that even the language they use any more? The good news is you don't have to worry. There is no reason to fret. There are at least a dozen web building and hosting companies out there that can give you exactly what you need. Many are small shops that can't kick back and rely on the fact they are big names in the Internet business. They have no option but to offer a product that is top notch with all the bells and whistles. But, let's not put the cart before the horse. We aren't going to make your next steps easy, because they aren't. Hard work is what really pays off. So you need to find the best online template maker available to get started. Problem, is there aren't any - except for one. Doodlekit. This makes it easy for us to suggest using our website creator, that it has a template wizard that is unmatched. Template design is a no brainer if you use what we offer to kick off the first steps of your web construction today. We might offer your best solution, and believe we do, but all throughout this article we have been focusing on how unique your website shall be, down to the greatest detail. In fact, even if you have several web page template makers at hand and they all allow you to do everything you want, each offers different tools. In the end, you, as the website artist, will do your best work with a certain medium in hand. Or maybe you are better with charcoal than the paintbrush? The reason we throw this artist metaphor at you is because the software tools available with all the diverse template makers out there are analagous to a painter's brushes, pencils, oil paint, or clay. Depending on who you are, the best tools for making your art come alive will be different. Some of us are simply better with oil than pastels or water colors. To rephrase, we belive the web tools out there are but several artistic options, and each will fit your hand differently. The ability to create your vision is the same with each, but each will perform differently in every individual's hands. If you have never worked with a real template maker, we challenge you to sign up for a free website with Doodlekit and see what they are all about. We call our template maker a "template wizard," which is in line with software development lingo in which a "wizard" pretty much lets you do anything you want, as a user, be it in connection with a software application, GUI, or plugin. For us, our template builder is a "wizard" at designing your website. It lets you create everything you want, as if you were wielding a magic wand! Caveat, a lot of companies will offer you what they call a "website template builder" but we don't believe this is what you are really getting. They aren't giving you anything like a wizard. They don't really help you build anything, not from the from scratch perspective at least. 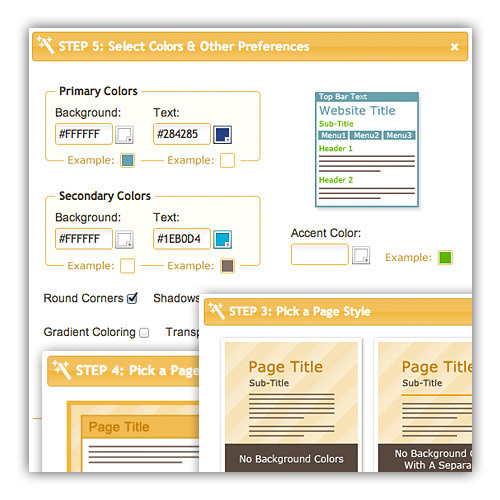 Instead, you probably only get to select from a few pre made design templates with a few color scheme options. This is not necessarily a bad thing. If you want something simple, such a solution may be for you. However, should you desire to create your own layout, with all the placements just as you want them, along with a diverse set of choices involving the colors, images, videos, or even audio you intend on using, then the Doodlekit template creator/wizard is likely your ideal solution. As we have emphasized, you can try us out for free, without gimmick or obligation. We don't even ask for your credit card information, or any financial information whatsoever. However, beware, having our diverse tools at your fingertips is not without challenge. When you have a real website building wizard at your fingertips, you are taking the responsibility of being your own web architect, from ground up. Don't worry. No programming is required. We've taken the programming aspect out of the equation and made this part simple, point, click, fill in the blanks, or select. The real challenge for you is more of an artistic and marketing research endeavor, or even a heroic effort, especially if your website has a commercial focus. Competition is tough these days! With this said, let's get started with using your powerful template maker/wizard. Below are a few big picture things to consider. As mentioned above, if you are building a commercial website, you have a challenge ahead. Not only do you want your first visitors to stay after first finding you through a referral or an Internet search, you want them to purchase something from you. Not only this, you want them to visit you again and again, and keep buying from you. With this said, we believe you have three important challenges. How often do you search for something on the Internet? We'd bet almost multiple times per day. You type in your search and hit enter, a page of links appear, and you click on the first few links. How long do you stay on most pages? Most likely, you only stay on most pages for less than a few seconds. They don't catch your eye. They don't look legitimate or helpful, or even the images and colors detract your interest. The losers get nothing more than a glance, and within only a few seconds you are clicking the back button. In most cases, you stop and spend time on the site or sites that win your heart the moment you set your eyes on them. Not all that catch your eye win your time or money, but this first capture is a definite pre condition to their even having a chance at your becoming their customer or return visitor. In the best of all worlds, you end up bookmarking the sites you really love and they become a daily part of your life. You will forever go there to shop or read the articles from this day forward. How to win your visitors at a glance isn't easy to answer. In every case, the answer is different. But remember the old adage, a picture is worth a thousand words? Said another way, using the right header image is more than half the battle with winning your visitors within a first glance. The Doodlekit template builder of course makes uploading, cropping, and placing the right header image into your site a piece of cake. The hard part is finding, or designing, or taking the right picture that will forever become your customer and visitor winning header image, even the cornerstone of your site. But before we get to how this is done, we will say how it isn't done. Though our website template builder does give you a library of many images you can use, even as your header image, we advise you to be very cautious when considering whether to use an image from any library or from any other pre established source. Why would you want to make the cornerstone of your business a picture that is being used elsewhere, by someone else? What you will be showing your visitors upon their initial arrival should be unique and one of a kind. If at all possible, because you are unique and one of a kind, your header image should be found no where else but on your site. It must also be eye catching and impressive. It is, and always be the first introduction you give your visitors and customers, and it will become your image for those returning to you. It really is your initial handshake. Your header will forever be the familiar jingle of the front door when your customers arrive. As we keep emphasizing, the most important part of your web page template is the header image you will be uploading, cropping, and placing into your website. We know it needs to be unique. In a glance it needs to say what you sell, do or offer, and it has to give an immediate impression that keeps visitors first arriving at your site, as well as encourages them to return. This is no matter to be taken lightly, and you should treat it as if you only get one shot. To change your header image after your site has gone live can be like rebranding a business and starting over again. You need to aspire for doing it right the very first time. So, given the importance and gravity of selecting, photographing, or designing the image that will forever represent you or your business, you need to do your homework! Yes, this is a simple answer to a complex challenge, and a little elbow grease is required, so how do we get started? Don't reinvent the wheel. As we said, do a little homework. We suggest that this can be done in two steps. First, go look at all the web sites you have bookmarked. Second, look at the websites of your competitors, with an eye towards those you know are succeeding. Why focus on the sites you have bookmarked? Because we believe that being bookmarked is one of the greatest signs of success, period. Bookmarked sites are those who have not only attracted customers or visitors, but have been deemed worthy of being revisited. In commercial terms this means returned customers. In blogging terms this means returned readers or contributors. Of course don't copy or plagiarize anyone. Emulate them. Do what the successful websites have done to become what they have become. And not to digress, what exactly is it about each's header image that makes their sites work so well they are bookmarked? What do these initial images say? What makes them attractive? Finally, back to don't invent the wheel, there are reasons your successful competitors are making money or attracting the audiences they want. Without copying them, you want to do as they do. They know what works, Make a list of your toughest competition, go to their sites. What do you notice first (yes, about their headers, as this will be what you see in the first few seconds of your visit)? Likely, it will be the instant picture they offer you of what they look like, what they are about, what they do. Perhaps all you will see will be their logo or their company name or the style of font they are using, or even their color scheme. All of this can be a header image too, or essentially function to serve as the same thing. It does not always have to be a photograph. In fact, their whole "image" may be a creative background. In any event, take notes. What is it about the first impression of their look/feel that makes you want to buy from their online store or contribute to their forums or blogs. Or just stay on their sites a bit longer to read a few articles? As a corollary, who are your non-successful competitors? Go see what their header images look like. What might they be doing wrong? Lessons learned can be both negative and positive. In coming up with your first impression, you don't want to be a guinea pig.